Piano, guitar, clarinet & sax - Techniques & Instruments. One the most important goals of piano lessons for my students is the ability to read music and become independent learners. However, I do not recommend learning the notes by chanting "Every Good Boy Does Fine". It is absolutely necessarily for every beginner to know the order of music sounds and music keys back and forth, from any point on the Grand Staff the way we know our own room's plan enough to move through it in total darkness. That's why I use different techniques such as intervallic reading, discovery learning, spiral curriculum, and the sequence of Sound, Feel, Symbol, and Name in my lessons. • Discovery learning is a pedagogical process in which the teacher asks a sequence of questions designed to lead students to "discover" the answer for themselves. • Spiral curriculum involves relating new material to the familiar, going from the known to the unknown. • The sequence of sound, feel, symbol, and name - Music learning should start with an aural experience because music is sound. After there is a clear aural perception of the musical concept, it should be experienced at the instrument (feel) and felt by the body. Then the music symbol (notation) can be recognized, and finally, a name for that symbol can be learned. • Intervallic Reading - this approach to reading music notation starts with gradual-staff notation, one line at a time, allowing students to focus on one interval (distance from one note to another) at a time. Note-reading is introduced by contour (direction and interval) and notes are grouped by patterns, allowing students to see the spatial relationships. 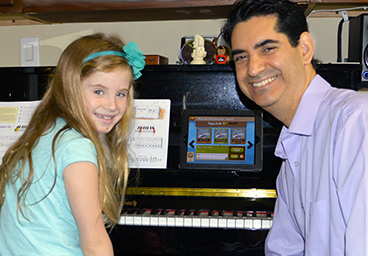 This approach to piano instruction has a focus on listening. Young students copy what they hear and see in the same way they learn to speak English. When learning a language, toddlers hear their parents speaking, begin to mimic words, and then learn to express ideas in sentences. Much later, they learn a system of visual symbols for the language and learn to read and write it. In the same manner, with the Suzuki Method, students listen to the songs that they will learn well in advance. Then at the lesson the teacher helps students map the sounds of the melody that they already have stored in their minds. The process starts with simple steps that every student can follow. As students become familiar with the keyboard and how the keys are arranged from low to high pitches, the process start to make sense and they progress to play more difficult pieces with hands together. In the mean time, I include level-appropriate music reading materials so that students develop eye/hand coordination, a vital skill for music reading. I offer a fun and easy guitar course for children. It starts with three-string chords and progresses through music notation. This course includes reading, writing and improvisation. Harmonic, melodic, and rhythmic topics are addressed as well. The guitar styles include classical, pop/rock, Christian, jazz & blues. This course focuses on the development of beginner-level performance skills for clarinet and Saxophone. This is an invaluable preparation for school band. I cover the Essential Elements 2000 method. This course centers on music that is fresh and different every time, music created by the student. The materials are rhythmic patterns, chords and scales and surprises and discoveries are always in the air. In this course for intermediate and advanced students, they learn the foundations of composing and recording music and become familiar with basic tools and techniques for recording MIDI and audio. Students learn to manipulate and arrange multi-track audio, and mix their own songs. This course introduces and explains concepts that will help music students to have a broader understanding of the elements of music, become familiar with the operation of notation software programs, compose melodies and accompaniments on the computer, and use notation software to create their own arrangements.